With the 2018 Who Do You Think You Are? Live show dead and buried, have we hit a brickwall with large UK genealogy events? Shortly after the 2017 Who Do You Think You Are? 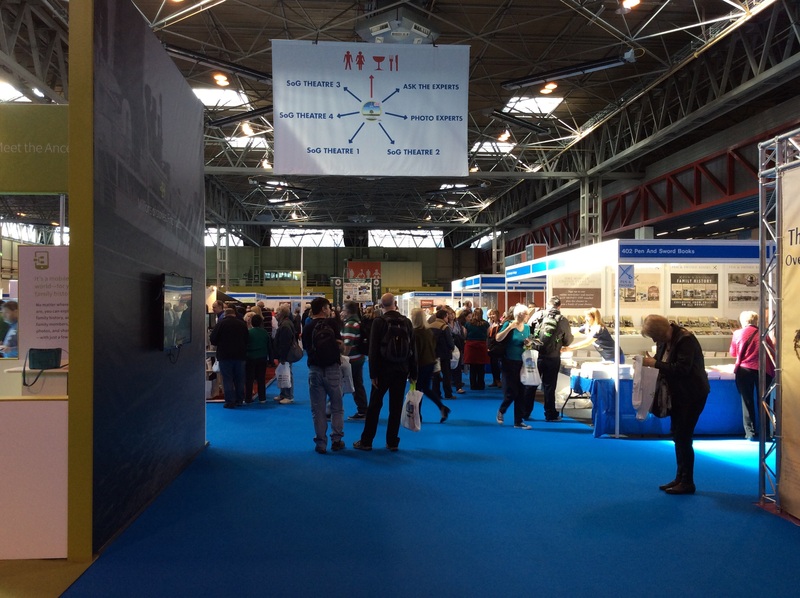 Live show ended at the Birmingham NEC, and the last genealogist was gently nudged out of the venue, the doors locked. Forever. Then the news began to trickle through saying that the much-loved live show would not be returning. For me, this was sad news, having easily recovered from the shift from London’s Olympia just a few years before, I was sad to not be going to the next one. I’d attended several in it’s ten year history of shows. I’m trying to think what a WDYTYA? Live 2018 show would look like in all but name. The two-floor Who Do You Think You Are? Live at London Olympia in 2014. What makes me attend the show? What brings the thousands of attendees from across the country and the globe (yes, globe!) to tread the NEC’s bright blue carpets? News of the cancellation has been missing from the Who Do You Think You Are? Live team themselves, almost as if one day they were working and suddenly all locked out. Even the show’s official website still talks about how they’ll be returning for their 11th show, and that they “invite you to explore highlights from previous shows, browse our extensive photo galleries and get an idea of what is in store for 2018”. You have to turn to the affiliated magazine to find out why the show has been cancelled – owners Immediate Media (who took over in 2011), have found the show has been making a loss. What could replace WDYTYA? Live? If there’s to be a replacement in 2018, then organisers are surely to already be working hard to plan it – and maybe they are. A huge show like Who Do You Think You Are? Live takes many months to organise – and even something half the size would be no mean feat. Debbie Kennett about to demystify autosomal DNA at Who Do You Think You Are? Live 2017. In the Autumn edition of the Cambridgeshire Family History Society Journal, a tantalising note can be read: “We understand that there are proposals are being made for a new event format at a new location. … no firm details as yet we’ll keep you posted..“. Given that this Society also knew about the Birmingham switch ahead of the curve, maybe their inside information is something to get excited about? So what would get me out of my house, travelling many miles, staying in a hotel, and spending 3 days walking around talking, thinking, watching, listening, and eating genealogy? Venue – an easily accessible venue, with good facilities. I remember there being great concern from stand-holders and attendees alike when I seemingly broke the news online in April 2014. Brands – 2017 saw those DNA tests at their most competitively priced, and there was a fair range of brands – small and large. A few charities, and age-group-targeted-clothing had crept in (hopefully you know what I mean! ), but if they’re in the minority and willing to pay for a stand, then okay. Experts – I’m not particularly worried about celebrity talks. I’d rather hear talks by reputable family history/genealogy/DNA/Archives experts, who have put the hours in, felt the pain, and achieved their own results. Social spaces – One of the biggest things that kept me coming back to the show was how it would draw a large number of people, and that included those I’d grown to know – initially via twitter or this blog – but then being able to call the friends too – even a slightly-convoluted relative was met there (hey, Amelia!). The Tweet-ups were also good fun. 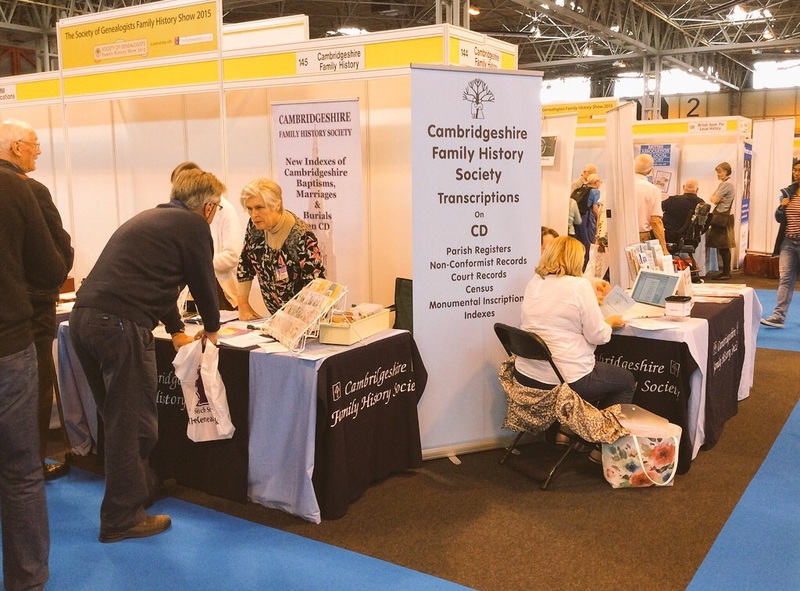 Societies – The Society of Genealogists helped ensure that the local history societies had a presence and a voice at the show. It was always a fantastic opportunity to get to talk from the experts on their stands – they could tell me about record sets, and all the kinds of things that only local historians know about the area they live and research. Wifi – As a family historian, and an event attendee, I need wifi. That might be to look things up, tweet a friend, or upload an image. Sometimes the availability has been scarce, leaving suspicious groups of family historians to gather in the corner of the hall. If you want to amplify an event to a wider audience who might then come along, or feel envious and come next time, then allow attendees to do it from within the event, rather than pushing them outside or to a cafe to do it – that gives them a reason not to return. Without the 2018 show in my calendar, there’s a big gap that I feel I need to fill with something similar. I’ve no intention to head over to RootsTech in the US – as someone with paternal and maternal ancestors who rarely strayed from the same 30 mile radius for the best part of 450 years, heading over to the US to hear about American records, feels like it’s not a valid reason. I know a few people who have been, but I don’t think that it would be worth it for me. One of my favourite bits from RootsTech though is definitely the video interview booth – and wished this had been mirrored at WDYTYA? Live, again helping the show to reach further. Or that someone like StoryCorps had made it into the show (or at least the UK). Regardless of what we do or don’t get in 2018, I am going to miss not attending the show – the whole experience: from my hotel in Coventry and leisurely train ride to the NEC each day, through to the experts on the society stands, and the meeting of old friends. My local county family history society, who normally run a genealogy event in September each year, are seemingly not doing so this year, and there’s no sign yet of next April’s ‘Big Family History Fair’ held by my district family history society. Even my local family history societies seem a bit quiet on the big event-front. One of the most intriguing sounding events appearing in 2018 seems to be Secret Lives – a collaboration between Society of Genealogists, AGRA, GOONS, and The Halstead Trust. 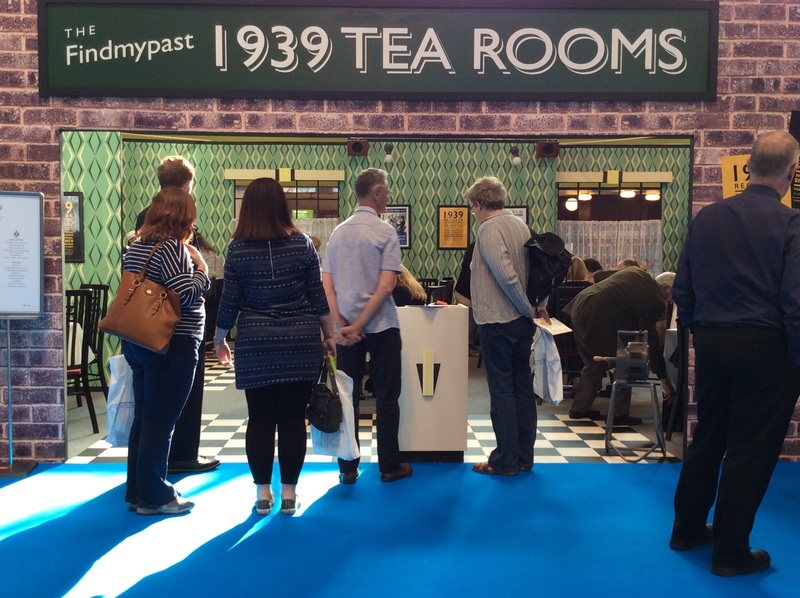 The FindMyPast 1939 Tea Room at Who Do You Think You Are? Live. What do you think a Who Do You Think You Are? Live-like event should be like, or do you think they’ve run their last? What will you miss about the show? Are you going to any alternative genealogy events instead? Let me know in the comments below. As ever, thanks for reading, and happy tree surgery! What have the first 2/3rds of Who Do You Think You Are? Live 2017 been like? Here’s my findings.. This year I decided that I would visit the annual Who Do You Think You Are? Live show for just two days, rather than three. For the last few years I’ve done the full show, but with lots of other things competing for my time at the moment – packing up my house, and moving in 2 weeks time, and a load of pots and trays of seedlings in need of my attention (see my gardening blog), I’m pre-occupied. It was great to get to meet up with some familiar faces – friends who i’ve made from my previous visits, or who I’ve got to know via Twitter conversations and the likes of #AncestryHour. It’s also great to meet with some new faces too, and that includes companies. As soon as you step into WDYTYA? Live, you can see exactly who the big sponsor is – Ancestry. Their stand seems to get larger each year, in floorspace and height. Still, it’s packed with information-hungry researchers all looking to smash through a brick wall with the help of their research team. Ancestry with their three-pitch stand. Just how much bigger can they get? 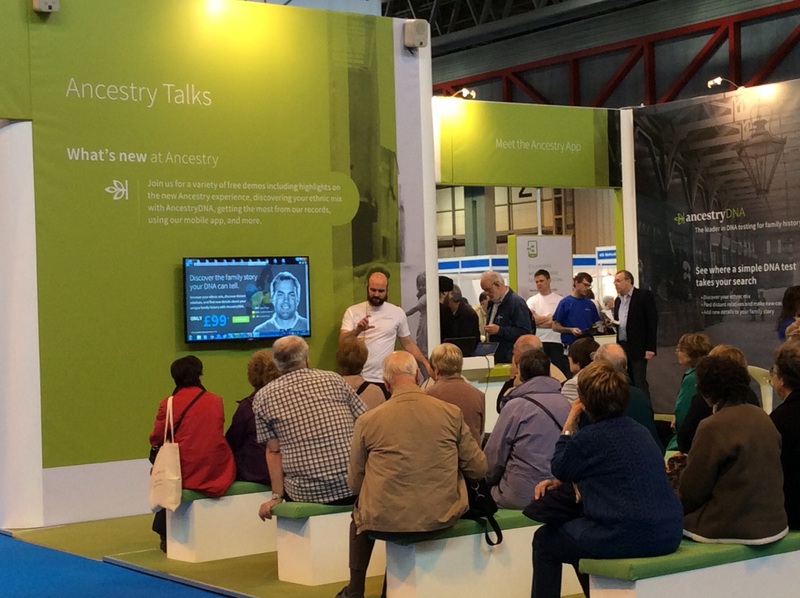 Ancestry’s big sell here is obviously their AncestryDNA kit, and even if you somehow missed this whopping great big stand, you’d soon be looking for them as their tests are a hot topic of the many talks in the orbiting theatres. Once again they had their own mini theatre to help curious family historians to learn more about autowotzits and mitre comicals or something like that. If only more test-takers would add family trees to Ancestry!! AncestryDNA’s stand includes a mini theatre where you can learn how the test works, and how to crunch the data. I swung by the FamilySearch stand, which like previous years seemed very busy, and also like last year, was running series of small demos and tutorials. I managed to join the back of a group of people watching a demo of researching my beloved 1851 census. FamilySearch’s tutorials are free and on their stands. My favourite talk by far on the 2 days was Debbie Kennett‘s talk ‘Autosomal DNA demystified‘. I’ve keenly followed Debbie’s articles and advice on DNA over the year, and so I knew that I’d be a fool to miss this. Her talk clearly lead us into the topic of DNA, the types of tests that are out there – including their benefits and shortfalls – and then led us through how to analyse the data. She also reminded us that whilst DNA is the ‘in’ thing right now (and her stage was surrounded by DNA testing companies), that you should go into it and prepare for the unexpected. I always find Debbie’s advice to be very clear, even when it’s technical, and her approach to advice always feels impartial. There’s so many companies out there vying for your DNA test money, but it’s hard to pick out what each one can give and how they compare. Debbie seems to be the voice who talks about this. Stand of the show clearly goes to LivingDNA – which really stood out with a big screen and swish stand. Living DNA had a huge screen stand, and they really stood out as the fresh, new, sparkly attraction. Living DNA are currently running a test for me, so I hope to report back on this in the near future. There was definitely what seemed like a price war on this year, with AncestryDNA having slashed their usual price of £79 (excluding that annoying £20 P&P) to £49 (i bought 3 more), and with FamilyTreeDNA pitching at £40, and with newbies LivingDNA pitching at £99. Other tests were also available, but I didn’t spot the prices. I wondered whether the DNA Test ‘price war’ simply indicates that the main players have finally recouped their product development and marketing budgets, meaning they can now discount their tests, mixed with the surge of competitors making the price more volatile. It feels a bit like it’s a race to the bottom (so to speak), but I think there’s also a need to be clearer about the differences between the tests. I was really pleased to see that Dr Turi King was back at the show, talking about the Richard III case. I first saw her (as a VIP!!) back in 2013 when it had only recently been revealed who the mystery skeleton was. It was great to hear some of that story again, and also pick up the factoid that poor Richard is missing his feet still. Maybe he had good boots on that day, and someone took an easy way of getting them! I mentioned this revelation on Twitter, which annoyed Richard III, who despite being somewhat lifeless of late, seemed to get a bit annoyed at Dr King for revealing it. I guess we should all tread caref…. Oh. I was really pleased to bump into Paul Carter and Pam Smith – two more of my regular show chums – and I was really interested to hear about their new Name&Place project which I’m really looking forward to seeing at next year’s show (no pressure!!). Speaking of ‘where’, I think that this year was the first year ever that Genes Reunited’s stand has been absent. Obviously, as a company, they have been passed from pillar to post, but seeing as they’re now part of the same product family as FindMyPast, then I guess they’re slowly being absorbed out of existence. Twile and FindMyPast at their WDYTYALive stand in the middle of the show. It was great to see Twile on the FindMyPast stand, and their infographic idea really strikes a chord. I think infographics are great at giving bitesized pieces of information in a memorable and eye-catching way. Family history needs this, because I’m all to familiar with just how exciting it can be… but not to the person I’m telling it to. Their eyes glaze over as they get confused by the distant cousins and multiple greats. Once again, I caved in at the Pen & Sword stand following what is probably now my annual papping of it. I love books, and I’ve got loads of them. I tried to resist, remembering that I’ve got to pack all of mine up into boxes and move them in a couple of weeks… but I was finally lured back to the stand and bought just one more – the final copy of Stuart A Raymond’s ‘Tracing Your Nonconformist Ancestors‘. I also popped along to see the team from MacFamilyTree, not because I’m really thinking about replacing my Reunion software, but I wanted to see what theirs was like, and whether I could finally hunt down a family history software that doesn’t have printable charts that look like they were last designed in 1997. I find that a lot of these modern on-device software releases (as opposed to online subscription websites) are great, but the printable chart options really let them down. I’m not 100% sure I’ve found what I’m looking for still. Maybe I just need to begin a start-up company. Anyway, that’s it for my two days at the 2017 WDYTYALive show. What did you make of it? I think this year I went with little expectation or preparation, aiming only to get 2 more DNA kits, to sit in on some more DNA talks, and to catch up with those familiar faces. I did all that, and enjoyed the show. As I look at my show purchases, I’m trying not to think about how much money I spent – more of how much money I saved on waiting for the show to get the show discounts, and how many more relatives this will enable me to connect with. Some of my WDYTYA? Live 2017 show swag. I don’t think my feet or my bank could handle a third day, so I’m glad to be at home with my feet up and a cuppa in my hand. Enjoy Day 3 of the show, and as ever, happy history hunting! The postman brings a reminder that some serious genealogy indulgence is right around the corner. Well, 83 miles West. I’ve been so busy lately – for the last five months I’ve been helping my parents to clear my late uncle’s house, whilst also going through a house sale myself, and preparing to move in about 5 weeks time… but amidst all that chaos comes a treat, and I was reminded of this this morning when my postman made my letterbox rattle. My Who Do You Think You Are? Live tickets have arrived. One of my two Who Do You Think You Are? Live 2017 tickets. This year I’ve opted to just attend 2 days – Thursday 6th and Friday 7th April. For the last few years I’ve done all 3 days, but as I need to be packing up, and paying solicitor bills(!! ), I’ve opted for just 2. The show is once again at NEC Birmingham, which I’ve found has continued to be just as enjoyable as when the show used to be in London. Maurice Gleeson explains how to identify which bits of your tree give you your X and Y matches at Who Do You Think You Are? Live 2016. I’m not sure which talks I want to attend yet, but I’ll be browsing the timetable real soon – suspecting that I’ll be magnetised for my usual nerdfest over the latest DNA innovations in genealogy, and insights into newspaper archives. I’ll be keeping an eye on twitter for more of the now traditional ‘tweetup’ flash events (that’s a meet up arranged via Twitter, usually involving a photo of the attendees – like the one below, which I’m probably going to get in trouble for digging up once again! 😀 ). Are you going to WDYTYA? Live this year? What are you looking forward to seeing? As the sun sets on Day Two of Who Do You Think You Are? Live 2016, I take a look at some of my favourite bits. Having walked more than 10,000 steps around Day Two of Who Do You Think You Are? Live, I’m now sat in my hotel with my feet up as we head towards the finale of this, the show’s 10th Anniversary year. As with Day One, I threw myself into the DNA themed talks again, and enjoyed some great sessions from Maurice Gleeson who gave a fascinating guide at how to identify which bits of your family are giving you which bits of DNA, and in turn help you work out where your DNA matches match up with you. Maurice Gleeson explains how to identify which bits of your tree give you your X and Y matches. Later on, I returned to listen to John Reid talk about the case of Richard III and how research led to a 99.9994% certainty that the skeleton was the former king. John Reid examines the evidence in the Richard III case. Each step in his talk presented the varying pieces of evidence, at which point he’d ask if we believed it was the dead king without doubt. Unsurprisingly, it wasn’t until mt-DNA that the audience felt reassured that the body wasn’t just someone random. John made the great point that ‘DNA is not a trump card’, and emphasised that it’s just another source to examine and consider. As a tech nerd, who builds websites and loves using tech to tell stories, a talk titled Technologies For Timelines led me to stand for a few minutes in the morning for my £3 workshop ticket. Ron Arons talked impartially about a wide range of online tools and desktop software that can be used to turn family history data into interesting interactive content – maps, timelines, and map timelines hybrids. He also covered a few of the pros and cons too. Speaking of timelines, I bumped into Steve Bardouille from the team at Famberry, who showed me their latest demo. The site’s interface has changed somewhat since I last saw it, with a load of customisation features for users, and a really slick timeline and tree building feature. I was also really excited to see what looks like a new idea to reach the geneasphere – pulling in the data from unclaimed estates, and looking for matches. FamilySearch giving talks on search at their stand. I returned to the Society of Genealogists section, to find the Lincolnshire Family History Society, and with my iPad to hand carrying my synced Reunion11 tree, the team on the stand were exceptionally helpful and kindly spent time with me to see if I could extend my Watson family tree knowledge. I came away with an index CD for records covering the parish of Fleet and its neighbours, and a handful of leaflets. Once again, the show allowed me to meet and catch up with geneafriends old and new (or perhaps longstanding and recent is better), and I look forward to tomorrow’s final part of the WDYTYA? Live 2016 trilogy. There were plenty of train delays for arrivals coming in from Birmingham New Street, and a few from Coventry. If you’re coming by train, give yourself plenty of time if you’ve paid for your workshop tickets already. In theory, delays tomorrow could be horrific given the potential visitor levels for a weekend day. The Breakfast Sandwich (bacon and fried egg – yum!) from the café is a great set-up for a busy morning, but have a wander around the NEC complex as there’s plenty of less busy and competitive food outlets…including a quiet Starbucks down some stairs. The wifi is unreliable, but I was able to find the battery-eating 4G. If you’re hungry for wifi, simply step out of Hall 2 (re-entry is permitted with a hand-stamp).. there’s loads of stable, powerful, free wifi there. Look out for deals – Pen & Sword Books had some great deals on today. If you’re a Twitter user (follow me on @familytreeuk) then look out for tweets with #wdytyalive and #tweetup – giving you opportunities to meet fellow genea-nerds just like you, over a coffee in real life. Until tomorrow, happy tree surgery! Day One of Who Do You Think You Are? Live 2016 is over…. So what is this year’s show like? Ask the Experts – kind of like speed dating for genealogy answers. Now into its second year at the NEC, the show has certainly made its home here, and the days of the two floor Olympia are now heading further into my foggy reminiscence. This is also the 10th Anniversary show, not that you can tell yet, but whilst it took me a few years to start attending, the years have seemingly flown by. As I wandered around today, I got the feeling that maybe the stands were a little more spread out, or maybe simply less imposing. It felt like there was plenty of space to move around, and it was pretty easy to get up close to talk to people or browse products. Gone is the exciting 1939 themed café that marked Find My Past’s launch of the 1939 Register, and the number of WWI themed stands seemed to have reduced a little. However, the formation of the Education Zone (including a lecture theatre, and close-up WWI artefacts) feels like a great addition to the show. Ancestry, the show’s sponsor, dominates the entrance again with what feels like a stand that’s twice the size of last year. This year they are still showcasing their DNA autosomal test (yeah, I bought another one), and this time they’re offering it at £59 – that’s abt 40% off and cheaper than last year (£70 I think). 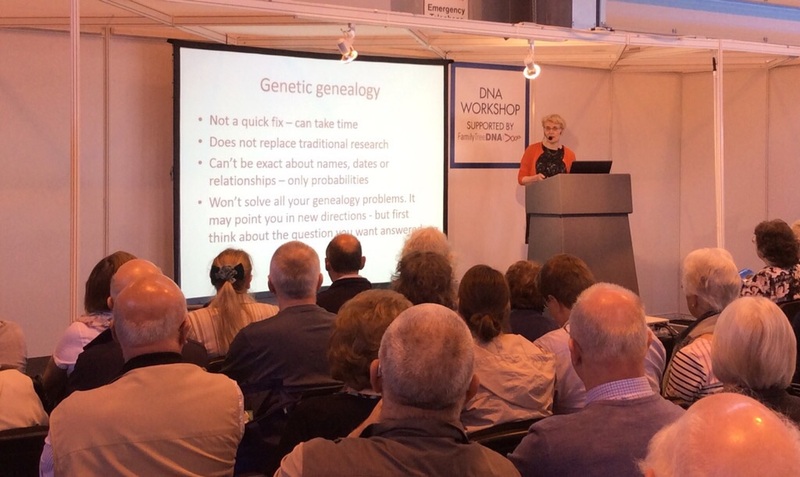 DNA is still a hugely hot topic, and there’s plenty of other stands offering kits and advice on this subject. There’s also a specific DNA lecture theatre, covering a range of topics and a range of levels. Prof. Mark Jobling of University of Leicester talks demographic history. Having discovered what appears to be my surprise Jewish ancestor, I had plans to seek advice today – and the team at the Jewish Genealogical Society of Great Britain stand, who were able to give me a few pointers as to where I could seek more records to help unravel the mystery. It was also great to see what the Societies were offering, and I made sure that I visited my home teams of Huntingdonshire and Cambridgeshire to see what they had to offer. Myko Clelland (FindMyPast), presenting in the Education Zone. There’s always so much to take in with the societies, because they produce such a wide range of materials or publish some fantastically niche record sets of which some are so specific and small scale that the larger companies would never find them financially viable. You also get to speak with people with that specific local knowledge – go see them! The wifi was very unstable and mostly useless. In previous years it’s worked a treat. The show is in exactly the same place as last year. There’s some great offers on this year, so have a good browse before you commit. There’s a beautiful Spitfire parked up at the back of the hall. I heard Else Churchill (Society of Genealogists) landed it there herself. The 10th annual Who Do You Think You Are? Live UK show is almost here, but what will this year’s show bring? When I booked my tickets to the 2016 Who Do You Think You Are? Live show, it felt like such an unbearable time to have to wait for, but as my tickets plopped onto my doormat this week, I realise it’s almost time to go, and I feel ill-prepared for it! In just a few days time (7-9th April), the Birmingham NEC will be host to a veritable banquet of genealogical talks, services, suppliers and societies, and thousands of genealogists and family historians. Last year I was apprehensive of the shift from London’s Olympia to Birmingham, but as with that old saying of ‘you don’t know until you try‘, I tried and found that actually it was quite a nice simple alteration to my annual pilgrimage. WDYTYA? Live 2016 ‘hot topic’? I’ll be there for the best part of all three days again, and I’m hoping to attend plenty of keynote and workshop talks, catch-up with a number of genealogy chums, and enjoy immersing myself into the show’s 10th year. Last year’s show was full of stands and talks all about the First World War centenary, and DNA testing (I bought two kits from AncestryDNA), and I don’t doubt that this year will see any decline in conversations about those two subjects. WDYTYA Live is also a great place to get to see brand new or forthcoming new record sets and online tools. Last year was the 1939 Register that was proudly unveiled by FindMyPast and The National Archives (the video below includes some of the launch entertainment). The year before, it was the Lives Of The First World War project from The Imperial War Museum and FindMyPast. I’m wondering what this year’s ‘topic’ or theme is going to be? Personally, I’m looking for storage solutions – both physical and digital. Yes, there is Dropbox and Google Drive, and those acid-free wallets and photo pouches etc, but I need something along the lines of ResourceSpace (Open Source and free) with Dropbox attached to it, at a family historian price-tag level, not a Reuters photo catalogue price-tag. I’ll also be looking out for ideas with my Assistant Archivist hat on for The Littleport Society, as we have a ton of artefacts to store. I’m also keen to find out about Jewish records, after an unexpected twist in my Tabraham tree seems to have suggested that I have a Jewish part of my family. A group of Tabraham surname-holders turn up in a parish church baptism record – each have their parents un-named, and each comes with the note ‘a Jew’. I’d like to find out whether this was a common practice, and why, and whether there are any Jewish records that compliment these Anglican church baptisms that might have a bit more information. I’m also interested in finding out more about accessing divorce records or simply just seeing if a divorce is recorded as having happened (yes, I’m trying to determine whether I’ve found a bigamist with two concurrent growing families in my tree), and I’m hoping that the GRO will be back again to talk about it’s aims of turning their postal certificate service into an order/download service similar to the Find A Will service. 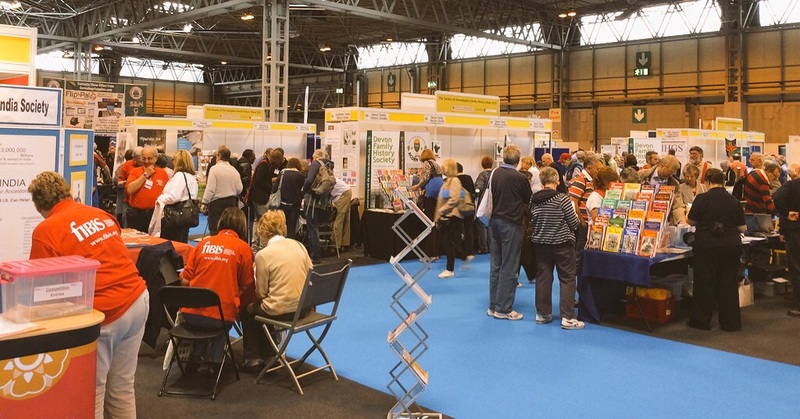 I’m also looking forward to seeing all the Society of Genealogists stands – I find these stands fascinating as there’s usually so much knowledge at a local level, and you don’t get that with the larger silent pay>click here>download genealogy big brand services. As ever, I’ll be keeping my eyes peeled for some of the many #tweetups that take place over the three days where Twitter users meet each other IRL (that’s ‘In Real Life’ in web-speak) for a ‘hello’, group photo, and extra tweeting camaraderie over a coffee. So, let me know if you’re going too, and feel free to say a ‘hello’ IRL (or via Twitter if it’s less awkward for you) if you see me wandering around. Who Do You Think You Are? Live 2015 in pictures – plus confirmation on the WDYTYA? Live 2016 show dates. Now that I’m safely home and recovering in a bath of tea from this year’s superb 3 day Who Do You Think You Are? Live show, I thought i’d share my photos. Else explains that the plans changed over the weekend – presumably based on the success of the show rather than a guesstimate of its success, given that it had also moved home. Due to circumstances beyond our control, we’ve had to amend the dates for 2016. These will be 7, 8 & 9 April at the NEC. You can read the full Twitter conversation here. Right, on to those photos! Some of the attendees at one of the 2015 WDYTYA? Live tweet-ups. My WDYTYA? Live tickets have arrived. 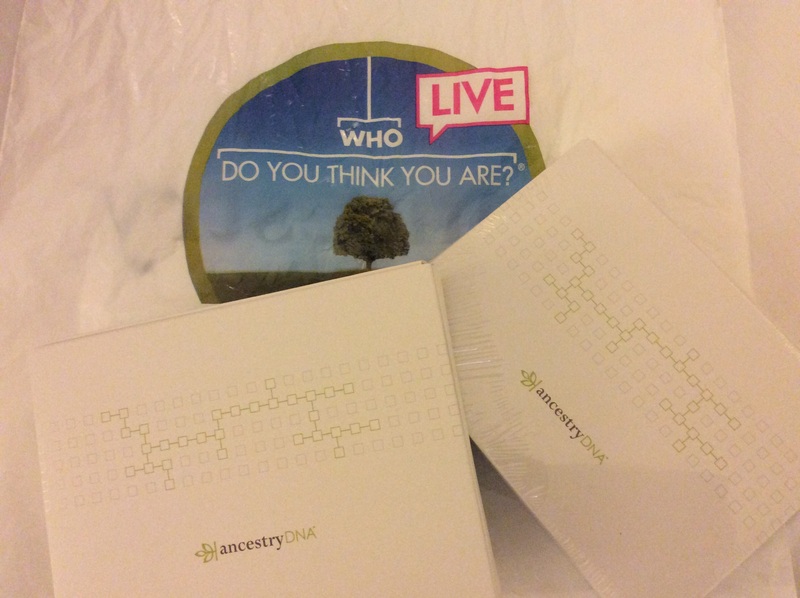 AncestryDNA has been a heavily promoted product this year’s WDYTYA? Live show. Some criminal reading to add to my reading pile. Summary of my third and final day at the Who Do You Think You Are? 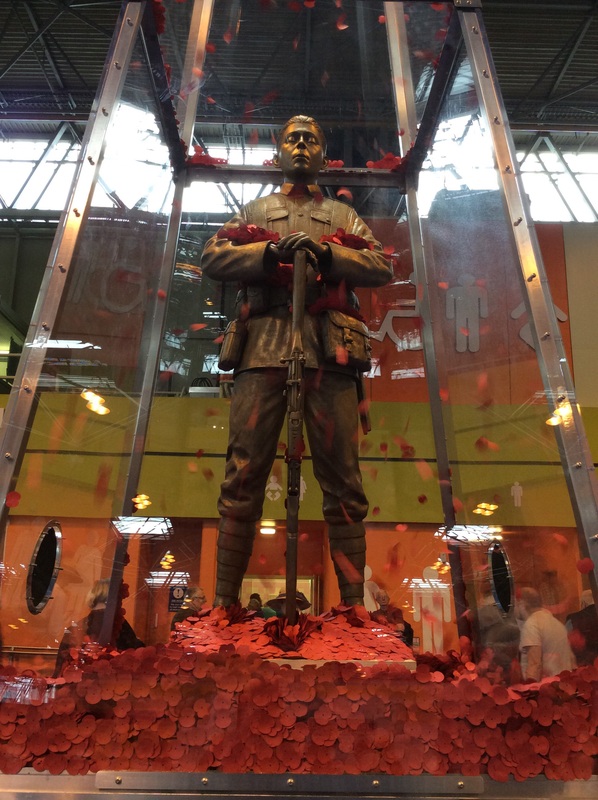 Live 2015 show at Birmingham NEC, including my favourite stand, and ticket dates for the 2016 show. Well, that’s it! The 2015 Who Do You Think You Are? Live show is over. If you went along, what did you think? Did you enjoy it? Was Birmingham NEC up to the job? Are you going next year? Did you think it was busy? Having checked out of my hotel in Coventry, and stepped off the train at Birmingham, I noticed that there was a ‘Tweet up’ (essentially, a group of twitter users, who arrange a time/place to meet up via twitter, and so extending the invite to a wide audience) about to happen, so a quick diversion via the courtyard, gave us a wonderfully sunny set of Tweet Up photos. After this, I made my way back into the show and noticed that the workshop ticket queue had reduced down nicely, so joined it behind a senior couple. Sadly, the woman in the couple was taking issue with the queuing system ‘this is the third day, and they haven’t managed to sort it out! The third day!’ she repeated to her silent male companion, and promptly decided to snap at the helpful ticket lady, who kept her cool perfectly. I hope you’re reading this – you should have seen the queue earlier. The ticket team seemed to be doing a great job. 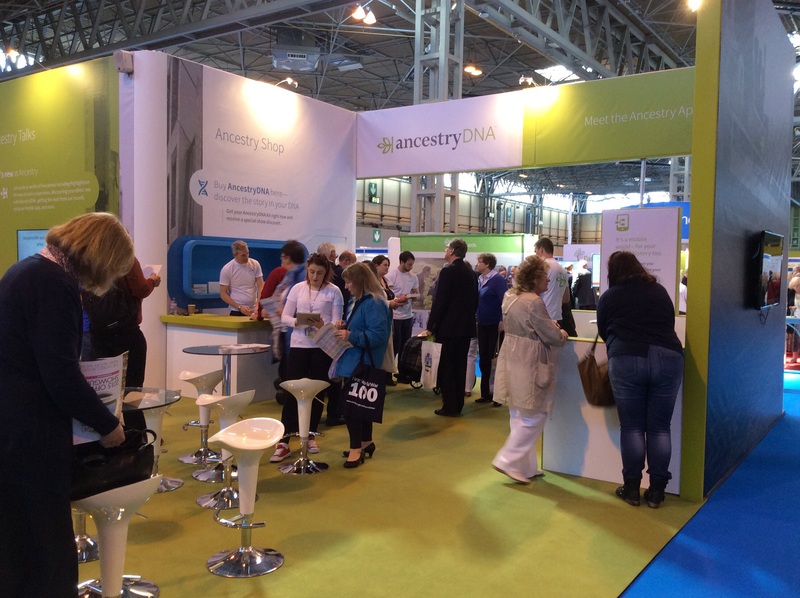 Turning around, I could see that the AncestryDNA stand was already doing booming business, again echoing just how much ‘DNA’ is this year’s buzz-word. I wonder just how many kits they sold over the three days? (and whether the testing period might become elongated?). I can only assume that the more kits that are sold in the UK, means that the data gets bigger, and the potential for more DNA matches increases. Moving on a little, I stumbled across Linda Kerr (from The International Society of Genetic Genealogy – or ISOGG) giving a talk on DNA for Absolute Beginners – her talk seemed very clear and straightforward, and whilst the buzz about DNA was resonating through a lot of companies this year, it was great to see that the basics were being covered too. I loved how my photo captured ‘Does not replace traditional research’. A very good point! I then headed over to the very well stocked stand at My History and picked up a load of archive safe photo pockets. I have a large collection of small 1930-1950s photographs in my grandmother’s photo albums, but when you pick them up, the photos all fall out because the sticky pages have dried up. Hopefully this should help sort, store, and put them safely back in order. 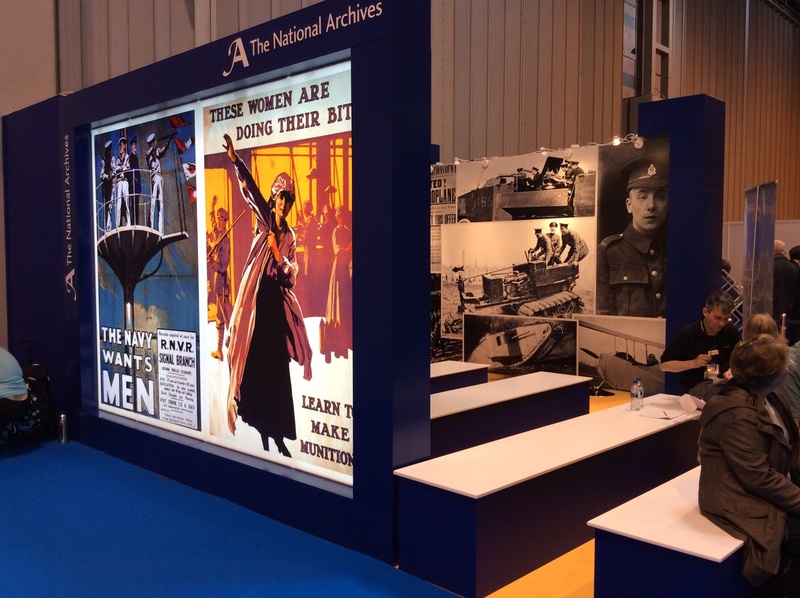 I think that out of all of the stands, my favourite design was The National Archives – i found it visually striking, wonderfully themed and lit. Of course, the 1939 Tea Rooms from FindMyPast, were wonderful too.. but it’s hard to compare them as their purpose was so different. I walked 29,454 steps over these three days – the equivalent to 12.81 miles. Most of this would be inside the venue. One thing I noticed this year, was that my enthusiasm for a third day was waining by midday. In London, if I dipped out early, I knew enough of London and had enough friends there, that I could pop out for a bit and do something else and head back, or head out early, but here at the NEC, it didn’t feel like that. Maybe next year, I might cut down to 2 days unless there’s some specific lure to keep me there/busy. Don’t get me wrong, the show is really worthwhile, but as a family historian, whose ancestors have struggled to move more than 10 miles within Cambridgeshire over the last 420+ years, it’s really only the ‘generic’ talks and stands that give me the extra value. Learning about Irish roots, or researching Scottish records, or visiting a specific locale society stand, will be hard to apply to my somewhat almost ‘insular’ research territory. Having said that, I’ve not done my DNA test yet… so that could all change. I’m still guessing Scandinavian is going to be in there. I’m yet to hear of the official figures for this newly re-homed show, but I did hear that day two (Friday) was busier than the first day. My brain struggled to imagine whether the show itself was bigger – as Olympia was always spread across a main hall and a mezzanine, with a few of the talks held off in rooms to the site, and the aisles between stands were about 1/3rd narrower than those in the NEC. It’s difficult to compare. That said, as revealed in the Who Do You Think You Are? Magazine 14th April email campaign, the show remains at the Birmingham NEC for 2016 and for 3 days – running 28-30th April 2016. Day Two of the Who Do You Think You Are? Live 2015 show at Birmingham NEC is over, and the final day is coming! If you’re yet to tread the halls of this year’s show, then here’s what you missed in Day Two. AncestryDNA has been a heavily promoted product this year. Right near the front of the entrance is the show’s main sponsor, in prime space – Ancestry. I’ve had my account with these guys (and FindMyPast) for some time, and this year the team are going all guns to promote their AncestryDNA product. Essentially this consists of a kit, that you can buy and register on their site, and then use to take a swab sample of DNA. Post them off, and then your results are returned to you online about 6-8 weeks later, via your Ancestry account. The results will then give you an ethnicity estimate (I’m hoping for Vikings and old Saxons), and then it will give you leads to other people who have taken the test on AncestryDNA, where they have found matching DNA. I’ve picked up two kits, as I was curious, and my mother has been far more excitedly curious about her DNA for some years. I guess that with all the other kits around, and with the recent discovery, questioning and burial of Richard III, the DNA market is booming. I’ll write more about the tests another time – so keep posted! Day Two was definitely busier, and even though the aisles are wider between stands (most noticeably amongst the Society of Genealogists Family History stands) they were still thick with busy, eager, genealogists looking for the next clue. 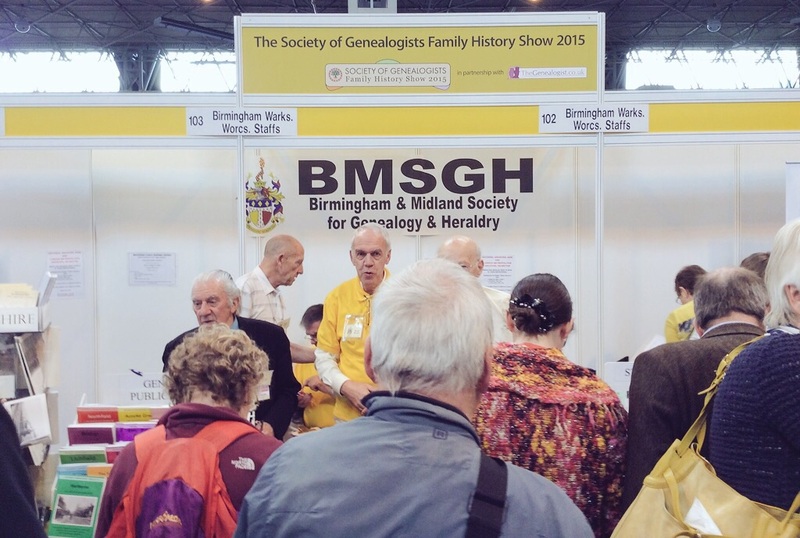 The Home Team – the Birmingham & Midland Society for Genealogy & Heraldry was naturally a busy spot to be. I have only a couple of distant relative marriages in Birmingham, so I didn’t need to stop.. but the team certainly looked busy! As with yesterday, where I was able to catch Alec Tritton talk about the many wonders of The Parish Chest, and caught some of Jayne Shrimpton talking about the dating of 80s and 90s photographs (1880s/1890s, okay! ), today I was able to catch some more. The first was from Dave Annal who gave a fascinating talk on the FindMyPast stand, on Death Duty Registers. I could tell that it was something to do with death and taxes, but beyond that I had no idea what they would contain. As a source, they look like the fantastically messiest, chaotic and cryptic set of possible information ever (beyond Doctor’s notes!). Later, I briefly caught the team at FamilySearch, who gave me a lovely warm reminder about the years of research I’ve put in working my way through microfilm. They themselves are in the midst of a big project to digitise microfilm, and are looking for volunteers to process batches of transcripts so that everything can become much easier to search. I don’t think that this was new news, but it was good to hear what they are up to. 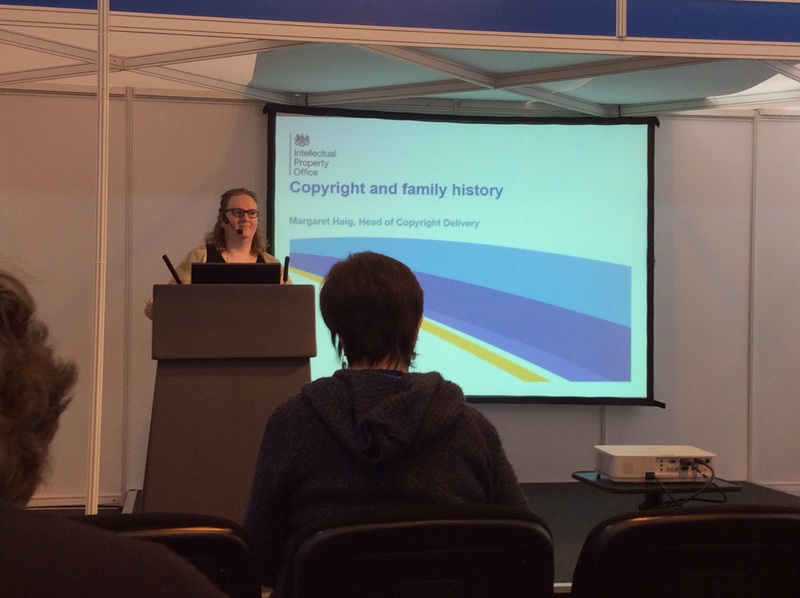 Finally, I sat in on Copyright and Family History – a talk by Margaret Haig from the Intellectual Property Office (IPO). She gave a fascinating talk on the law and the minefield of copyright when it comes to family history. There were loads of questions after, but I poppe along to their stand to ask them my one: Who owns the copyright of a Will? The answer I was given was that they are not under copyright because they are not a creative piece, they’re a commissioned piece of work that follows a formulaic formal process. This wasn’t really the answer I was expecting. I managed to meet Eric Knowles, and he was able to shed light on my mystery spoon… But I’ll write more about that soon too! 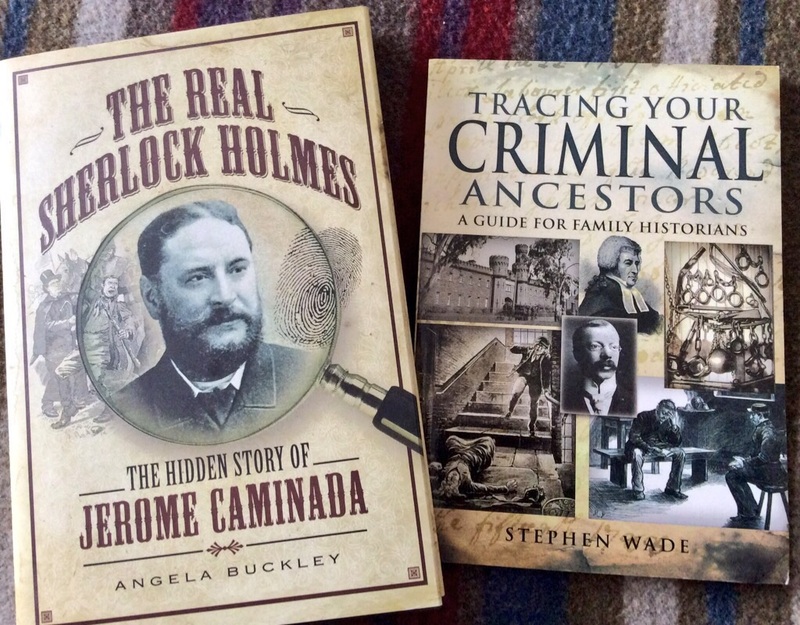 I ended my day by treating myself to two books from the team at Pen and Sword Books – one The Real Sherlock Holmes – The Hidden Story of Jerome Caminada by Angela Buckley, and the other one by Stephen Wade, titled Tracing Your Criminal Ancestors. I was flicking through the latter when the stall-holder asked me if I had criminal ancestors. I said ‘yes’, but reassured them it wasn’t for fraud as I handed my card over. Blog post from Day One of Who Do You Think You Are? Live 2015. Well, here we are, the end of Day One of the 2015, re-homed Who Do You Think You Are? Live show, at Birmingham NEC. Its been a long day, involving driving from Cambridgeshire to Coventry (where I’m staying), then onto the train for the token £2.10 return trip to Birmingham International station, which adjoins the venue. I spent the entire day on my feet, wandering around, sat in on some talks, and then went to the 1939 Register launch celebration by the team at FindMyPast. Then, train back, a gym work out, and now to my hotel room to write this. I’m new to the NEC and it seems perfectly adept at putting on shows. Briefly, due to the volume of posters as I walked towards the show, I thought I was about to arrive at a Transit Van show… but thankfully, no. The familiar tree logo was in sight and I arrived about 10:15am. Once in, I wandered in, and over to the FindMyPast stand where I sat in on a talk on Military Records and the extra features of the FindMyPast tree (audio!). Having soon gotten my bearings, I found myself checking out the Society of Genealogists family history show section of the event – the bit where the Societies come together and have stands. I was pleased to see Carol from my home team (Cambridgeshire Family History Society) was busy at their stand, but noted the absence of neighbouring Societies from Huntingdonshire and Bedfordshire. Right at the end of the hall were two great additions, one was a beautiful statue of a soldier, commemorating the First World War, and the statue was within a wind machine, that periodically would blow poppies upwards and you could then watch them drift down over the still, silent, soldier. Very poignant. The other, was the 1939 Find My Past tea room, set up to promote/celebrate the forthcoming release of the 1939 Register – the nearest thing we’ll get to a census for 30 years, due to the destruction of the 1931 census and the cancellation of the 1941 census, both due to war. It was also in this tea room, that an aftershow party was hosted, with various speakers, Society representatives and experts… and your humble bloggers, were treated to live wartime songs, and 1939 style food (I enjoyed the corned beef hash cakes more than I thought).